This photo was taken on January 2, 2018 at 6:36 AM. The location was adjacent to a side entrance to a dining room in the main building of an upscale hotel on the waterfront of the Potomac River in Washington DC. The "Take It!" 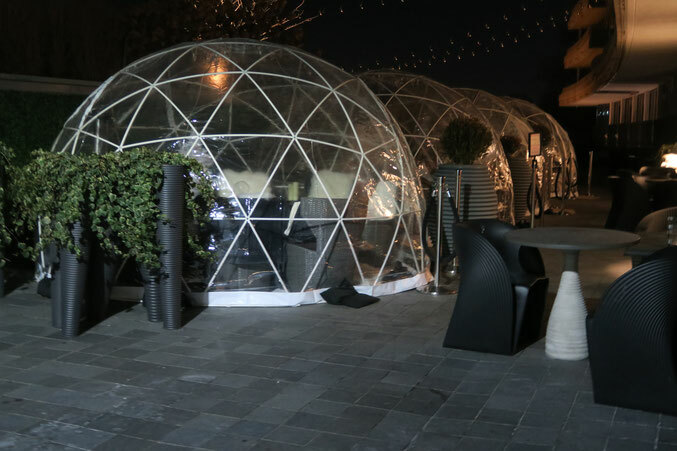 came from my having looked at these "Igloo's” for a number of times and actually walking next to them to see in and conceive of them being a good thing to be in to consume a meal when the outside weather is getting or has gotten cooler. The hotel in which they are located has excellent service - so I believe anything that would be on the menu would be superb. I think I will actually give this concept a try when they start to use them again just to see if the unusual approach has me feeling closed in, even though it is all done with clear plastic panels and has space heaters inside to assure a comfortable temperature. While being up for a try as an experiment - I think I would rather enjoy their regular restaurant with its high ceiling and reduced hassle for the wait staff to provide service. The After Take: Has most who have looked at this photo joining me in thinking it is innovative - but also siding with a preference to eat inside and pass up the "Igloo” experience. Here is hoping all of your dining has been in atmospheres that are spacious and cozy. Best wishes as we make our way through the Winter. That’s pretty neat, I could really use one of those. We have something similar at our house for the fire pit in our backyard. It’s not plastic and it has a hole in the top for the smoke, but similar in shape. Really makes sitting out by a fire much more comfortable this time of year. Wow I’ve never seen anything like that. It’s brilliant! Our daughter immediately called it an igloo. It doesn’t get cold enough here for us to need something like that but man it’s cool looking.